Apologies, ticket sales for this event have ended, but tickets will still be available at the door. The Lip Sync Battle to End all battles is here! 2 ALL STARS, 4 cities, one SICKENING tour! 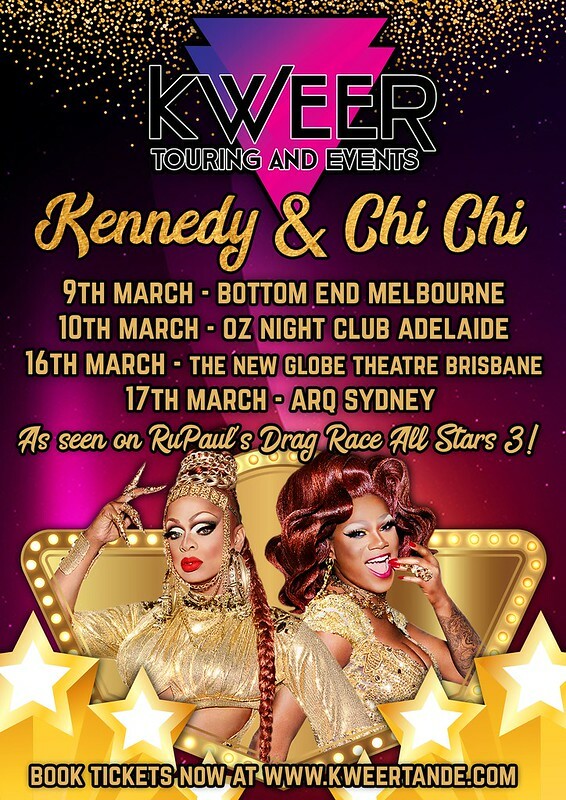 Join us as we welcome the first round of All Stars 3 Queens to Australia for 2018, the Old School (with a touch of New School) Kennedy Davenport and the Queen who doesn’t get ready… She stays ready, ChiChi DeVayne! We are thrilled to be working with these 2 ICONIC Drag performers, and are proud to bring you 2 All Star favourites in March 2018. GA tickets are $35 + booking fee. VIP Tickets are $70 + booking fee. Don’t forget to support your local KT&E Promoters, and get cheaper entry by using their codes. Glass of Champers on arrival. Group photo with both All Stars. Single person only.